As we celebrate St. Patrick’s Day on the 17th March here at home and abroad there is only one wildlife species that suits the celebrations best, the Shamrock (‘Seamróg’ in Irish). The shamrock is known around the world as one of the symbols of Ireland. It is worn on St. Patrick’s Day as it is said that St. Patrick used the three leaves of the shamrock to describe the Holy Trinity (three persons in one God – the father, the son and the holy spirit). However, did you know that there is actually no such plant as a shamrock! Shamrocks are actually young clovers and there have been many debates throughout the years as to which clover the ‘true’ shamrock comes from. 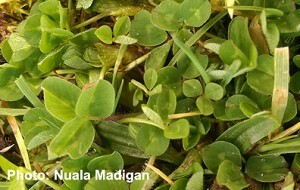 A native plant, clovers are widespread and can be found growing in grassland areas or along roadside verges. Their leaves are an important food source for many caterpillars of butterfly and moth species. In farming this plant is also very nutritious for livestock. It can also fix nitrogen from the atmosphere reducing the need for fertilizers. The plant does this by forming a symbiotic relationship or partnership with Rhizobium bacteria. Clover is a perennial plant meaning that it can live for two years or more. These plants die back in Autumn and Winter and then re-grow from their root stock in the Spring and Summer months. The young leaves of the plant known as ‘shamrock’ emerge in Spring followed by the flowers in May. The two most common clovers you will find locally are the red and white clover. As their name suggests the white clover produces white flowers while the red clover produces pink/red flowers. Both flower heads are rounded and you will find them flowering from May-October each year. Although the shamrock may not be a species in its own right, knowing now that it is simply a young clover plant, I think it will remain with us all as one of Ireland’s much loved wild plants. This entry was posted in Wildlife Watch at the Bog of Allen Nature Centre and tagged Activities, Attraction, Bog of Allen Nature Centre, experience, Wildlife. Bookmark the permalink.